Phones & Hearing Aids: No More Static! Modern hearing aids have become highly sophisticated in recent years offering hearing aid users many high tech features that include superior noise reduction, information sharing between a set of binaural hearing aids, and automatic program change in response to the user’s changing sound environment to name a few. So it seems difficult to believe that many hearing aid users report difficulty hearing well on the phone. In his survey of hearing aid users published in 2005, Sergei Kochkin found that hearing aid users reported dissatisfaction with their ability to hear on the phone comparable to their difficulty hearing in large groups. In a more recent study published by the American Journal of Audiology in 2009, the authors reported that over 70% of experienced hearing aid users performed poorly when using the phone. Absence of Visual Cues: Those with greater degrees of hearing loss are usually more dependent upon seeing the person they are talking with to fill in some gaps in conversation. They must rely on audition alone using the phone. Background Noise: Those of us with normal hearing know the challenge of holding a telephone conversation in a noisy or busy environment. Have you ever closed your non-telephone ear because your environment was too loud? Now imagine that you have a bilateral hearing loss with hearing aids that amplify not just the phone but the environment. An impaired auditory system has difficulty handling this scenario without access to visual cues. Acoustic Feedback: This is that squealing sound a hearing aid can make when covering the microphone with your hand or another object. While modern hearing aid technology has virtually eliminated random acoustic feedback, placing a telephone handset next to the microphone of a hearing aid may cause some whistling. Even when the whistling is momentary this is irritating to the hearing aid user as well as their communication partner on the other end of the phone. Positioning the Phone: The loudness and clarity of the phone signal can vary significantly with very small changes in the position of the telephone handset relative to the hearing aid microphone. While experienced hearing aid users may be able to quickly position the phone for maximum audibility, maintaining this position becomes difficult for long phone conversations. Telecoils and Hearing Aids: A telecoil is a small magnetic induction coil that is in some hearing aids and also in most landline telephones. Use of the telecoil or T mode of the hearing aid effectively eliminates potential for acoustic feedback and also eliminates amplification of all noise in the environment as the hearing aid amplifies only the phone signal in the T mode. Telecoils are inexpensive and many behind the ear hearing aids come already equipped with this device. Placement of the phone on the hearing aid must be practiced using the telecoil mode. Wireless Streaming and Hearing Aids: Modern hearing aids now have the ability to stream audio signals directly from electronic devices, including cell phones. Wireless streaming eliminates background noise, has no potential for acoustic feedback and gives a binaural hearing aid user the advantage of hearing phone conversation in both hearing aids. Placement of the phone is not an issue as the phone does not need to be close to the hearing aids. Research has shown that hearing aid users perform best with wireless streaming. Additionally, smartphones offer hearing aid users the ability to obtain visual cues with use of applications like Skype and FaceTime (iPhone). 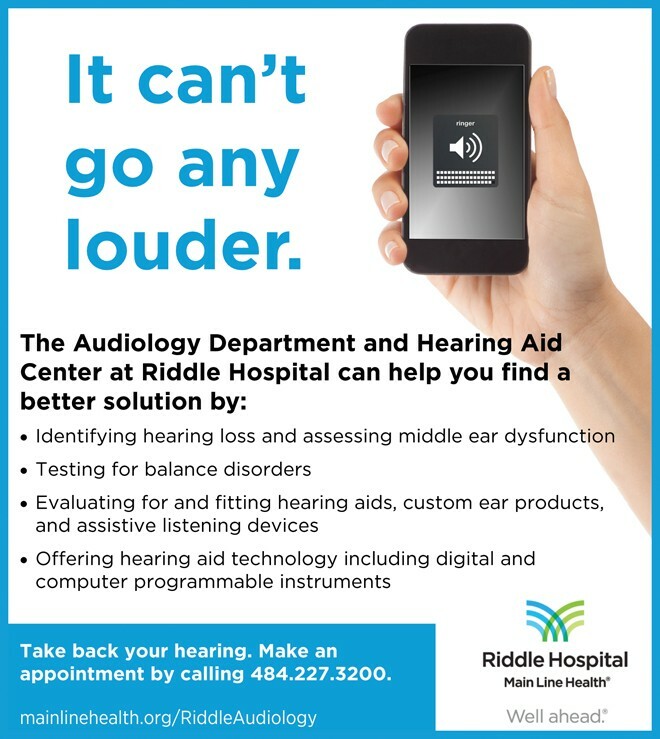 The audiologists at Riddle Hospital complete a Listening Needs Assessment with each patient that includes the patient’s ability to communicate using the phone. It is important to be informed of your choices. Ask your audiologist what telephone option is best for you.